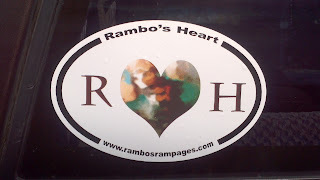 Rambo's Rampages...: A few things. One.) Rambo is sick again. Nothing new lately. He has some kind of acute pnemonia so he is back on antibiotics with the hope of keeping him home. It's been a pretty rough week but his fever has broken (for the second time... hopefully for good). His heart rate and breathing have slowed thankfully, but he is just starting to have labored breathing. He's doing a lot of sleeping and we hope that means lots of healing as well. The thought of going back to the hospital is looming over me. I'm trying to accept it with open arms, but I can assure you that I am just as tired of thinking about it as you are of hearing about it. Two.) Bumper stickers are in!!!! 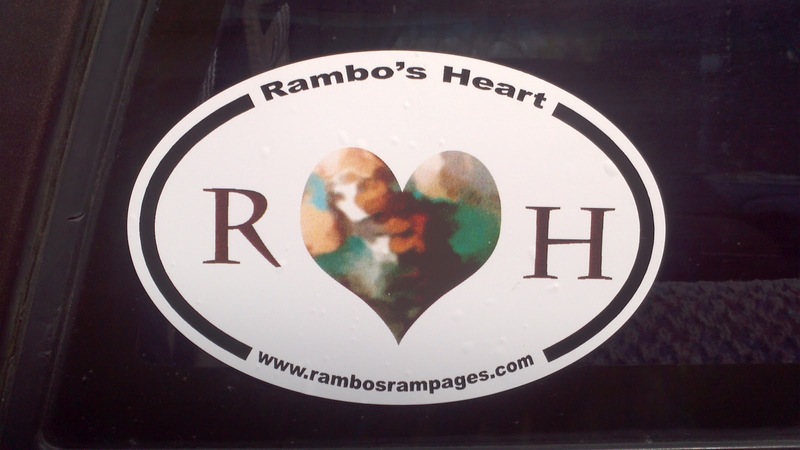 Check out Rambo's Heart for more info on getting one or some! Do it! Three.) Thanks to my wonderful friend who also happens to be my neighbor, I am getting a pedicure today! Woot! Not that any of you care, but my little toes are going to thank me. I can't wait! Four.) Just as pointless as number three, but, I'm going with it: I found a new way to tie my scarf and that makes me happy. It's the little things. Five.) Rambo will be having a surgical procedure on April 11. This will be to drain possible fluid from his ears and put tubes in if need be. They will also be doing a hearing test so we can find out the full extent of hearing loss/impairment if any. We have to be at the hospital at 6am- help me, Lord. It should be an outpatient procedure. Please pray everything goes well so we can go home the same day. Theodore has not had surgery since March of last year so I'm a little nervous. And finally.) We received the disc of medical records today. Over 1800 pages!!! I, obviously, have not looked through it all as of yet, but I have the hope that it is exactly what we were looking for. So thankful I didn't have to spend around $1400 for that. God is good. Enjoy the sunshine today, all. I believe over my way we are supposed to get rain tomorrow. Grow, flowers, grow! !